History has been kind to this center of universal knowledge, one of the first libraries in the Americas, and the first to offer freedom of entry to everyone. Through its carved wooden door have never passed the excesses of tyranny nor the ignorance of man. Yet intact in its structure, the Public Library of another time (the Palafoxiana) added to the collections of old books with a large collection of pamphlets and broadsheets, as well as manuscripts and materials essential to the study of the history of Mexico. In 1981, the Library was declared a National Historic Landmark. In 2005, the variety and richness of the collected literature earned the Palafoxiana recognition as a “Memory of the World” site from UNESCO. 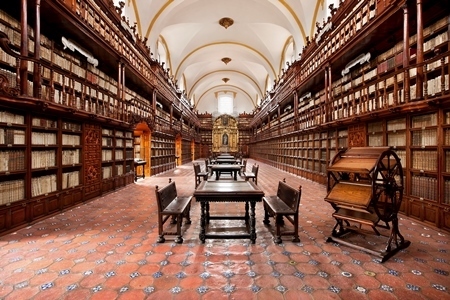 The Library thereby acquired still more responsibilities and tasks in preserving for another thousand years, in the service of science and culture, as was first wished by Bishop Juan de Palafox y Mendoza.